You may not be aware of this, but people have a lot of opinions about bagels. Recently at TS there has been a lot of controversy about bagels. Every morning that we serve breakfast after minyan (Monday to Friday and not on statutory holidays), there are bagels. The bagels used to come from a particular Toronto establishment that delivered them to us. Then this establishment stopped delivering. TS sourced the bagels from a caterer. Calling these doughy items bagels is being quite generous in this rabbi’s opinion. What followed can only be described as the bagel wars. Congregants were phoning complaining. They wanted their bagels back and then wanted them back now. Do not mess with Jews and their bagels. 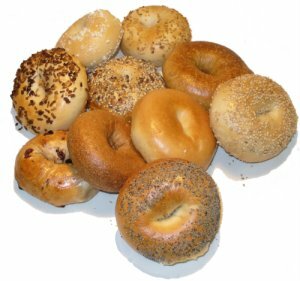 In order to determine what bagels were most popular and could best serve the needs of TS members (and this is without going into the whole Montreal v. Toronto bagel dilemma). We’ve sampled Gryfe’s, What-a-Bagel, and starting today, Bagel World. Where do you get your favorite bagels? This entry was posted in bagels, food, Temple Sinai. Bookmark the permalink. Gryfes is great if your teeth are not your own and you are not hungry. They are so light, I feel like I could float. What a Bagel, St Urbain and those establishments are middle of the pack as far as I am concerned. Sadly, the very best Bagel in Toronto no longer exists. The Bagel Bar on Eglinton was the very finest. There was an extra saltiness to them and the fact that they could be enjoyed while cutting classes (including Religious School classes) really made them tasty. My preference is for a well baked crusty and heavy bagel. This can only be had at Bagel World. But go early! The Bagel House on Avenue Rd., Montreal Bagels….yummy!! Bagel World is very good, but I’m also partial to the bagels from Bagel Plus at Sheppard and Bathurst. Their rye bagel is tremendous.